How do you visualize the law? The current ABA Journal profiles a number of people who are working on it. Robert Ambrogi, Visual Law Services Are Worth a Thousand Words—and Big Money. Bob Ambrogi, the article's author, states: "it is in the area of legal research that it could have its most direct impact on the day-to-day work of lawyers and law students." He highlights Fastcase, an online research system that features visualization tools, such as an interactive timeline that shows cases' influence and weight. Studying for the Bar Exam? There's an App for That! Is it permissible for a lawyer to look for information about jurors on social media? A new ABA ethics opinion (Formal Opinion 466) says yes (subject to local rules and court orders)—but lawyers shouldn't ask to connect with the jurors. See this article from ABA Journal online (April 24, 2014). Graphic: Drawing of jury by Charles Edmund Brock taken from: Thomas Hood, Humorous Poems ... With a preface by A. Ainger, and ... illustrations by C. E. Brock. L.P (1893); available in the British Library's Photostream here. Blogger, Facebook, Instagram, LinkedIn, and Twitter logos added by Mary Whisner. Happy Birthday, Library of Congress! I mean, signed a bill providing for the establishment of the Library of Congress. Indeed, on April 24, 1800, President John Adams signed a law providing $5,000 (close to $100,000 in present-day U.S. dollars) "for the purchase of such books as may be necessary for the use of Congress . . . and for fitting up a suitable apartment for containing them." 2 Stat. 56. These books were originally housed in the Capitol building itself, but eventually moved to a separate building. Quite a "suitable apartment," wouldn't you say? The Thomas Jefferson Building in Washington, DC, the oldest of the Library of Congress buildings. The Adams Building in Washington, DC. Just another piece of trivia in the always interesting Adams-Jefferson rivalry. And in case you were wondering, it was President Andrew Jackson who established a separate law department within the Library of Congress on July 14, 1832. 4 Stat. 579. 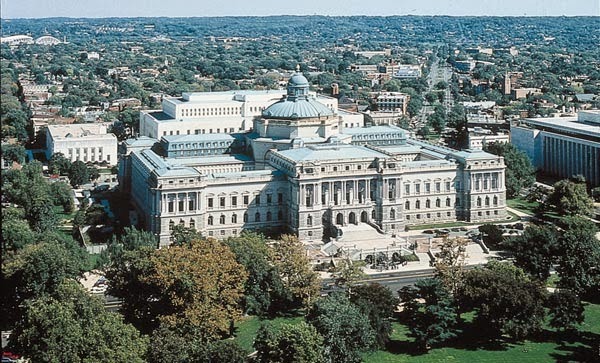 For more information on the fascinating history of the Library of Congress, check out Jefferson's Legacy: A Brief History of the Library of Congress. And the Library of Congress is so much more than just some big buildings in that other Washington with a bunch of books in them. They have a lot of interesting collections to peruse on their website, including maps, photographs and prints, sound recordings, and the vast American Memory collection (among others). Check it out. Make them feel special on their birthday. Images courtesy of HeinOnline, Wikipedia, and loc.gov, respectively. Today is the day we celebrate the 450th anniversary of William Shakespeare's birth. 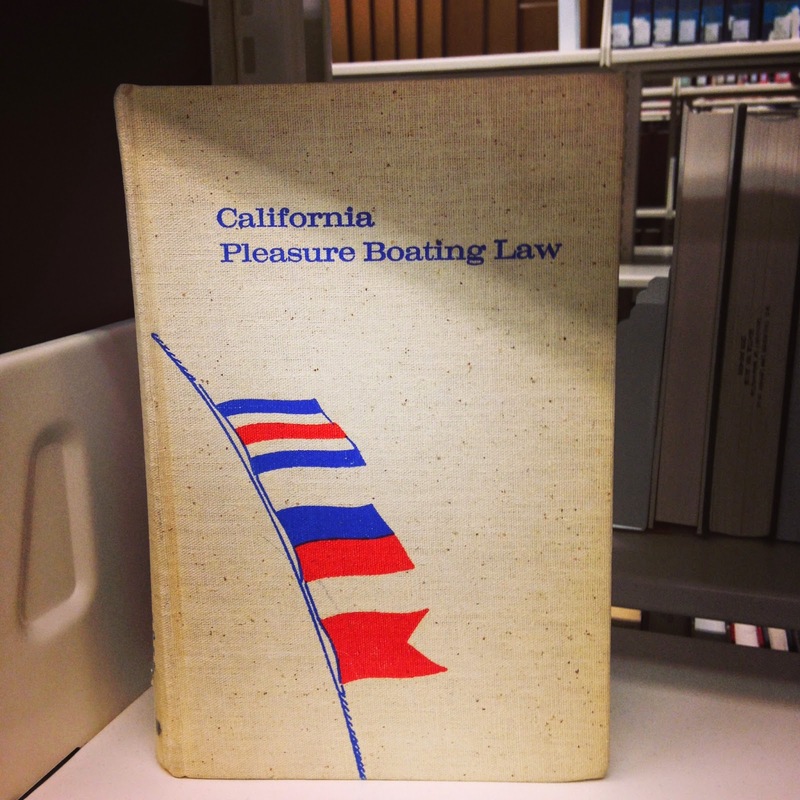 To mark the occasion, check out these books in the Gallagher Law Library collection. To find even more, just go to the catalog, and type in the keyword shakespeare. To find books located here, use the facets on the left hand side and limit to Gallagher Law Library. We had great turnout for the National Library Week Candy Jar Contest this year with a total of 22 submissions. Thanks to everyone for participating! The total pieces of wrapped candy in the jar was 143. There was an errant jellybean at the bottom of the jar, so the grand total was 144 pieces of candy. The winning guess was a very close 147. He won all of the candy and the jar! Thank you again to everyone for making National Library Week such a success! The ABA Journal online reported Pets in France get legal status as ‘living beings capable of feelings’ (April 18, 2014). What an interesting development! I decided to track down the actual law. Model legislation can be proposed by anyone, from large organizations with layers of process (like the Uniform Law Commission and the American Law Institute) to individuals. 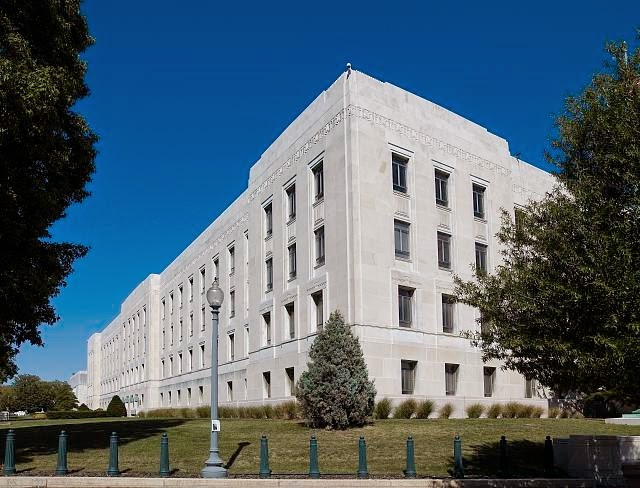 Awareness of model laws is important for drafters and also for advocates, as they try to influence legislation or to interpret it once it has been enacted. In this article, I discuss the sources of model laws in both senses of "source" - the drafters and the research tools. I begin with the Uniform Law Commission, the American Law Institute, and the American Bar Association: organizations that are familiar to many legal researchers. But I also discuss less familiar sources of model laws. For example, I had never heard of the Specialty Equipment Market Association, but twenty-two states have adopted its model law for registration of custom cars and hot rods. That group has only a few model laws in a very narrow field. In contrast, the American Legislative Exchange Council (ALEC), a group of conservative legislators and business leaders, has proposed hundreds of laws - often with success - on dozens of topics. Few people need to know about registration of custom cars and hot rods, but ALEC's work affects so many areas of the law that it deserves more attention from lawyers and other legal researchers. If you have a tough case, does it make sense to post your issue on a website and see what other lawyers will say? Legal Technology News looks at this new practice: John Edwards, Legal Research: Send in the Crowds?, LTN, April 16, 2014. The short answer: "Crowdsourcing is a powerful way of engaging legal research, but some lawyers feel it's useless, perhaps even harmful." To celebrate National Library Week, the Gallagher Law Library staff was again asked "what are you reading? What's on your nightstand, in your backpack, on your e-reader right now?" It's no surprise that people who work in libraries tend to be people who read outside of work. What may be a surprise is the diversity of what the law library staff reads (or is reading at the moment). We're reading fiction, nonfiction, memoirs, mysteries, sci-fi, and classics. We're reading politics, history, education, sports, and books about animal behavior. And more than one of us likes dogs. For a list of titles and authors, click on read more . . .
We have some fun activities planned for law students this week! The Library is hosting TGIT on April 17th from 5:30-7:30 in Room 115 or on the terrace if it's nice. Don't forget to bring your IDs! Submit a picture of yourself in the library or your favorite part of the law library on Instagram and tag it with #lawlibraryshelfies. At the end of National Library Week, we will select the winners of some awesome prizes! Come by the Reference Office and guess how many pieces of candy are in the jar. You get to keep the jar and it's delicious contents if you're the big winner! We also have a jar of candy available in the law student lounge (no contest for that one, just some free sugar courtesy of your friendly reference librarians). Current journal issues from UW Law have a high dose of high tech, mixed with constitutional law and public policy. The Washington Journal of Law, Technology & Arts released a new issue on April 3, with pieces on the Internet and the Constitution, patent law and global health organizations, YouTube as evidence of a threat in a criminal case, and online retransmission of broadcast TV. Vote for your Favorite 2014 Peeps in Law Diorama! Voting is open for the ABA's annual Peeps in Law contest! You have until 11:59 p.m. April 21 to vote for your favorite diorama. And who can forget this masterpiece from our own Peeps contest last year? You can see past winners here and here. Enjoy! Although it is no longer Women's History month, continue your celebration by browsing HeinOnline’s new collection, Women and the Law (Peggy) [UW Restricted]. The collection is dedicated to Ilene N. Hein, who passed away in 2012 and was co-founder of William S. Hein & Co., Inc., and to Margaret (“Peggy”) Marmion, the late mother of Kevin Marmion, William S. Hein & Co.’s current president. The collection, which includes books, biographies, and periodicals discussing women’s roles in law and society, contains over 800 fully-searchable titles. Since the oldest publication in the collection was published in 1609 and the most recent was published in 2014, the materials in this collection demonstrate the evolution of gender roles in society as a whole and in the legal system. Additionally, the collection features publications related to Emory University’s Feminism and Legal Theory (FLT) project, which documents scholarship on issues like reproductive rights, children, family relationships, gender, sexuality, religion, disabilities, and sexual abuse and violence. Women and the Law is located in HeinOnline’s alphabetical list of collections and is fully searchable. More information is available here. More resources related to women and the law may be located by using the subject headings listed below to search the Gallagher catalog. There's terrific footage, including President Johnson's speech when he signed the law on July 2. 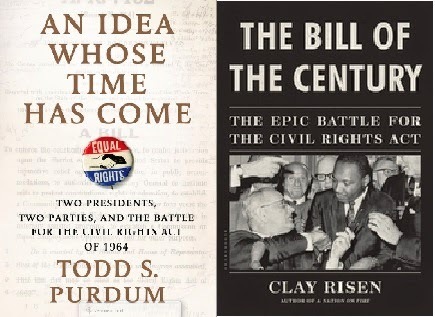 The accompanying article is Many Doubt 1964 Civil Rights Act Could Pass Today, April 9, 2014. The LBJ Presidential Library is hosting The Civil Rights Summit: We Shall Overcome, April 8-10. See also (or hear also): Don Gonyea, LBJ Legacy: Vietnam War Often Overshadows Civil Rights Feat, NPR Morning Edition, April 9, 2014. It's spring, and you know what that means! No, not the return of seasonal allergies. Baseball! Yes, America's (once) favorite pastime is back, so what better time than now to take a look at the law of baseball? 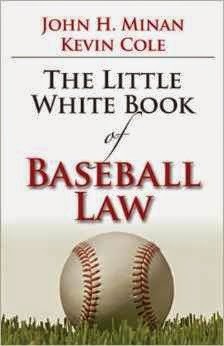 We here at the Gallagher Law Library have two great books on the law of baseball. 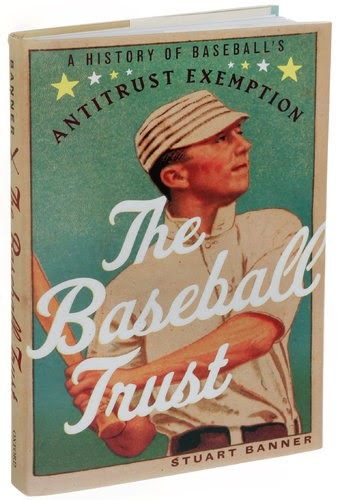 First, The Baseball Trust: A History of Baseball's Antitrust Exemption, by Stuart Banner, as the name implies, tells the story of how Major League Baseball gained its exemption from American antitrust laws (an exemption no other sport enjoys). In 1922, in Federal Baseball Club of Baltimore, Inc. v. National League of Professional Baseball Clubs, et al., the Supreme Court ruled that baseball is not subject to federal antitrust law because it is not a form of interstate commerce. The great Justice Oliver Wendell Holmes, writing for the court, stated, "The business is giving exhibitions of base ball, which are purely state affairs. It is true that, in order to attain for these exhibitions the great popularity that they have achieved, competitions must be arranged between clubs from different cities and States. But the fact that in order to give the exhibitions the Leagues must induce free persons to cross state lines and must arrange and pay for their doing so is not enough to change the character of the business." 259 U.S. 200, 208-09 (1922). In 1972, the Court affirmed its holding in Federal Baseball, and also held that baseball is exempt from state antitrust laws as well because of the necessity for "national uniformity" in the regulation of the sport. Flood v. Kuhn, 407 U.S. 258, 284 (1972). If you're looking for a briefer discussion of baseball's antitrust exemption, check out Michael Mozes and Ben Glicksman, Adjusting the Stream? Analyzing Major League Baseball's Antitrust Exemption after American Needle, 2 Harv. J. Sports & Ent. L. 265 (2011). Second, The Little White Book of Baseball Law, by John H. Minan and Kevin Cole, provides a number of stories in which baseball has intersected with the law. Each chapter tells the story of a different court case, on issues ranging from whether liability exists when a batter is hit by a pitch (Avila v. Citrus Community College District, 131 P.3d 383 (Cal. 2006)), to the legality of fantasy baseball's use of player names and information (CBC Distribution & Marketing, Inc. v. Major League Baseball, 505 F.3d 818 (8th Cir. 2007)), to stadium liability for spectator injuries (Benejam v. Detroit Tigers, Inc., 635 N.W.2d 219 (Mich. Ct. App. 2001)). This book is also available in our Good Reads Section at KF3989. M563 2009. Or if you're actually looking for the law of baseball - i.e., the rules governing the game - you can find them here. As an exercise in statutory interpretation, try to parse Rule 2.00's definition of "infield fly" or Rule 8.05's explanation of the "balk." And if you're looking for a way to kill hours of time, do some baseball research at baseball-reference.com. With your new found knowledge, get out there and watch some baseball! You can get $10 tickets with your Husky Card on "College Nights," April 25, May 30, June 13, and September 20. Or better yet, you can catch UW baseball games at the newly renovated Husky Ballpark for free with your Husky Card! You can find the schedule here. The Gallagher Law Library is always striving to exceed our users' high expectations for service. Today we are pleased to announce some exciting innovations. Mercedes is now embedding hot stone massage in the seats of its cars, so we thought: why restrict that experience to luxury cars? Starting this month, selected library chairs will also have several massage settings to ease the tension that long hours studying can inflict on shoulders and backs. Drawing inspiration from the hotel industry, we will make our library patrons users guests feel more welcome by offering fresh-baked chocolate chip cookies in the L1 lounge and the L2 student collaborative space each afternoon. 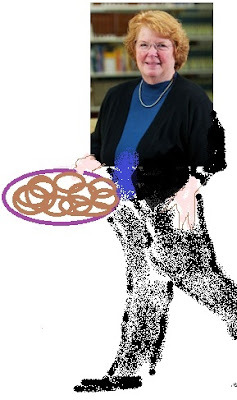 Says Associate Dean Hazel Pennington, "Nothing says 'We're glad you're here' like warm cookies!" Sensitive to students' dietary preferences and needs, of course we will offer snacks that are (variously) vegan, low-sugar, gluten-free, kosher, halal, lactose-free, and made without contact with tree nuts. The Law Library already provides students with access to half a million books and extensive online subscriptions, including Bloomberg Law, HeinOnline, LexisNexis, and Westlaw. In addition, we have staff who will borrow materials for students through interlibrary loan and reference librarians who will help students navigate the complex information landscape. We already help students do good work, so why not help the students look good too? To that end, we are converting a corner of the Reference Area to a salon where students can get their hair styled and nails done without having to leave the law school. A presser will even touch up your suit before a mock trial or interview if it got rumpled in your locker. Our goal is to give you the very best service we can, throughout the year (as well as on April 1).